Lake Tahoe, California, 1960s. Several guests arrive to seek shelter at the rundown El Royale hotel, whose main attraction is that it straddles the state line between California and Nevada. The guests include a vacuum salesman (Jon Hamm), a wannabe Motown singer (Cynthia Erivo), a priest (Jeff Bridges) and a hippy woman (Dakota Johnson), who have all brought more than just their physical baggage to the hotel. 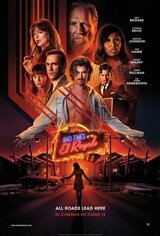 Each guest houses dark secrets about their past, which will all be revealed during one fateful night at the El Royale, a hotel filled with secret passages, cameras, and two-way mirrors, so every guest is under constant surveillance. The unexpected arrival of cult leader Billy Lee (Chris Hemsworth) proves the tipping point for this wild, unforgettable evening during which alliances will be formed, secrets will come to light, and no one is guaranteed to make it to their checkout time.